Here are ten meal prep ideas for beginners and busy people to get healthy food on the table fast! Meal prep has become a buzzword lately. It’s risen in popularity over the past couple years, promising to help you lose weight, save time, and save money. Does meal prepping really have all of these benefits? 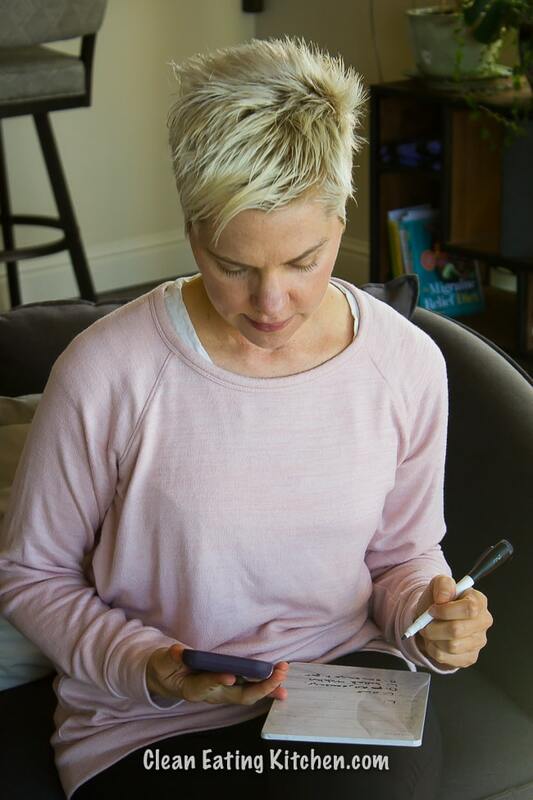 I say yes, and I’ll share why in this post. Don’t let the term scare you. Meal prep simply means working ahead of time to either get the ingredients for a recipe ready to cook or cooking one to several recipes ahead of time before eating them. Hardly anyone has the time anymore to prepare and cook every single meal. The fact is that it takes less time to microwave a frozen meal or order out than to cook a homemade meal from scratch–unless you’re meal prepping. Meal prepping truly lives up to the hype, once you get the hang of it. When you set aside the time each week to meal prep you clean eating recipes, there are several undisputed benefits that might just make all the difference for your health and your budget. Here are some ways meal prepping can benefit your health and budget. 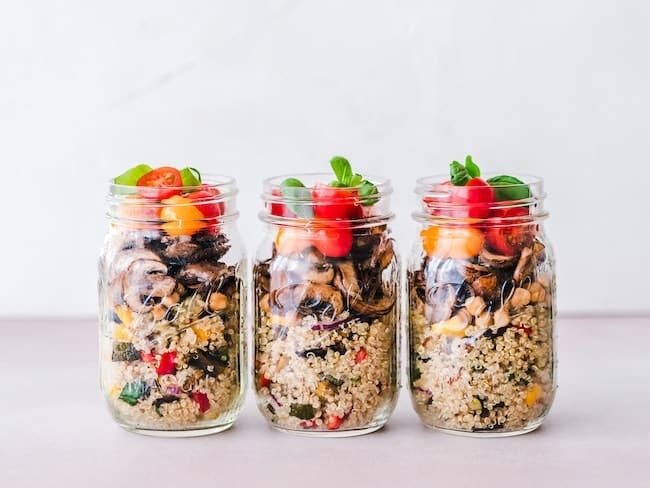 By following a clean eating meal prep, you can avoid questionable oils, preservatives, or quality issues, and you can create meals that follow your family’s dietary/allergy needs. You can also eat seasonally and choose organic ingredients, if that’s a priority. 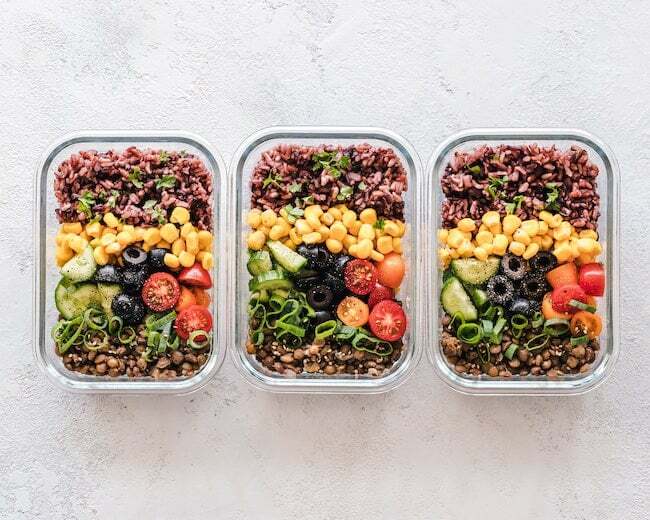 No need to scramble to think of what you can make and then go through the entire prep/cook process–with meal prepping, you have healthy food ready to go. Most of us aren’t in tune with our bodies enough to recognize creeping hunger or blood sugar signals–it’s something you learn! By the time you recognize that you need food, you still have to think of a meal and cook. By then, your blood sugar is already declining and sending stress signals throughout your body. This is a selling point for meal prepping that’s actually true. With meal prepping, you decide your meals ahead of time, write out your list of ingredients, and buy only what you need. Whole food ingredients are often cheaper than pre-packaged meals. When you stick to your list, you decrease impulse buys, lower your grocery budget, and decrease the amount of food you’re throwing away each week. It’s a win-win for your wallet and the environment!=. Everyone’s caloric needs are different–when your default is a frozen meal or box dinner, you have a portion size prescribed to you. You could be eating too much, or not enough. By meal prepping, you can pre-portion your meals to what you KNOW is the right amount of food for you. 6. Use meal prepping time to have a couple hours to yourself, or include the family. It can either be a relaxing few hours by yourself in the kitchen, or a great bonding experience to teach your kids about healthy food and cooking. Even the littlest of kiddos can help with washing or slicing veggies. How do you get started with meal prepping, especially if you’re new to it and/or don’t have a lot of time? Here are ten ideas for how to meal prep! You can also refer to this as “batch cooking.” Rather than making a couple big meals and eating the same meal for several days in a row (which turns a lot of people off of meal prepping! ), you just choose a few versatile ingredients that you can mix and match. A good way to follow this style of meal prepping is to batch prep a couple of proteins, some veggies, and some healthy carbs. As an example of how versatile your clean eating meal prep can be, just consider this 4-day menu using 2-3 pounds of cooked ground beef. The options are only limited by your creativity! Many people, including me, find that this buffet style of meal prepping lends enough freedom and variety to keep them from getting bored and giving up. I use a small white board in my kitchen to plan my clean eating meal prep for up to 2-4 days at a time. Here’s a good post with more about buffet-style meal prepping. If you have the time to cook even one meal a day, this can shave some extra time off your meal prepping routine. With leftovers meal prepping, you meal prep one or two meals, and then commit to cooking once every other day. For instance: you have breakfast and lunch meal prepped, but have time to cook dinner. Simply double your recipe and eat the leftovers the next day. Tip: For extra variety, mix up your meals! Eat breakfast for dinner and vice versa. I see some of my blogger friends having breakfast for dinner all the time. The Standard American Diet has us believing that there are “breakfast foods.” This is not true. Anything is a breakfast food, even last night’s leftovers. Once you rearrange your perception of what’s appropriate or not appropriate to eat at any given time, you open yourself up to an entirely new world of meal possibilities! That’s another aspect of meal prep that is so cool – you can adapt it to your own individual tastes and preferences. There are literally no rules to hold you back. Another meal prep idea is rather than prepping everything all at once, try prepping just one thing a day. For instance: your main dish on Sunday, veggies on Monday, snacks on Tuesday, etc. Besides buffet-style prepping, this is my favorite way to meal prep and not get overwhelmed. The Instant Pot can cut cook time by as much as half! A slow cooker can cook your meals overnight or while you’re at work. It’s pretty amazing how handy these appliances can be. I use both my Instant Pot and slow-cooker almost at least several times a week. Organize your prep by cook time. For example: baked sweet potatoes may take an hour at 400 degrees. While those are cooking, you can also roast other veggies on a sheet pan and get twice the cooking out of turning your oven on just once. While that’s all on auto-pilot in the oven, use your stovetop to pan-fry protein and let grains simmer. By the time your most time-intensive item is done, you have everything else done as well. The worst feeling is having everything ready to go for meal prepping–until you realize you’re out of something. During your weekly shopping trips, stock up on essential pantry items like broth, grains, spices, and baking items. Ready to get started with clean eating? Join my e-mail list and I’ll send you my free Clean Eating 101 e-book and recipe guide! Just because you want roasted squash for the week doesn’t mean you have to block out an extra ten minutes of time to go through the hassle of chopping! Take advantage of pre-packaged, pre-chopped, and pre-washed produce. Trader Joe’s, Whole Foods, and most nicer grocery stores have extensive sections with pre-chopped veggies. Clean eating meal prep doesn’t mean your dishes have to be boring! Don’t underestimate the value of spices. For example: use cinnamon and rosemary to bring out the sweetness of roasted veggies, or use salt and garlic to make them savory. In this way, you can use different spice profiles to mix up the flavor of the same item. If meal prepping every week isn’t realistic, try meal prepping for two-week stretches instead. You can freeze almost anything without losing flavor, texture, or nutrients. Freeze components separately or mix together for pre-frozen meals. Store in Stasher reusable silicone bags or air-tight glass containers. Meal prepping and eating healthy does not mean you can’t eat delicious foods that make you happy. You can make this a sustainable part of your life by prepping the meals and foods that you already love. You can also challenge yourself each week to cook something new! 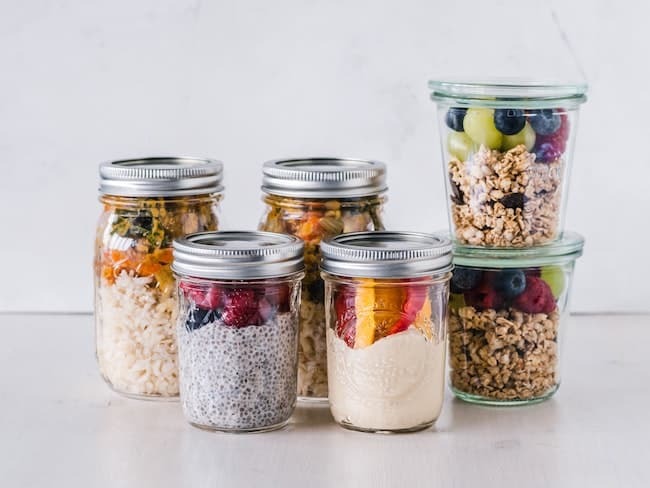 High-quality glass or stainless steel containers make your food taste better, last longer, and remove the risk of chemical leaching–especially if you’re heating your food in the containers. To celebrate the kick-off of your new meal prep habit, invest in a matching set of high-quality containers! These are a great bargain. Most real foods and healthy foods can be meal prepped, especially if they are recipes that can be re-heated without losing their quality. Is meal prepping good for weight loss? 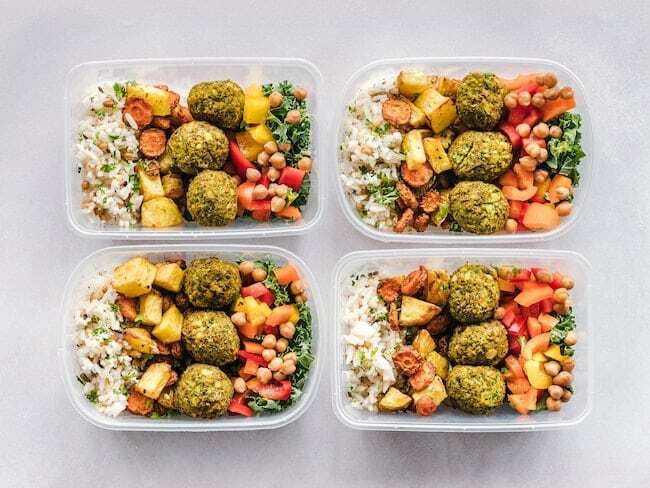 Meal prepping can be good for weight loss because it helps control portion size and quality of food. Meal prepping also means you’re less likely to have to eat fast food because you already have your food prepared. How long can you keep meal prep in the fridge? I recommend keeping meal prepped foods no longer than 4 days in the fridge. It’s important to keep prepared foods in tightly sealed containers in the refrigerator. This will help your meal prep stay fresh. How much does it cost to meal prep for a week? It depends, but you definitely will save money if you meal prep compared to the amount you’d spend eating out or buying prepared foods. How do you successfully meal prep? Plan ahead and make recipes that you know and trust. Meal prep foods and flavors you like so you’ll be more motivated and enjoy your food more. Remember, the point of meal prep is to have healthy and delicious food at your disposal. It’s not about just making diet food or bland basics. Have fun and enjoy your food. I hope you feel inspired with this post including meal prep ideas. Meal prepping is the best way to save time, money, food waste, and your diet. By setting aside a few hours one day, you set yourself up for success for the entire week. You can control the ingredients and portions and save yourself a lot of stress. My daughter is about to be moving out for the first time and she’s freaked out about food. I’ll suggest the idea of meal prepping to her. I’m sure it’ll make her busy university weeks run much more smoothly. And good storage containers is a great idea. I can’t tell you how many times my flimsy plastic containers from takeaway have broken. My husband and I try to meal prep for the week on Sunday afternoons. And I agree, having good container is key! It makes it so much easier to stay on track with healthy eating and really does help save money! These are great ideas! They will even work for vegetarian families. Meal prepping saves me so much time. I learned about meal prep last year when I started my healthier life journey. I have noticed that if I don’t take the time to prepare ahead, I am more likely to make a bad decision when I am hungry… Like, stopping at Sonic on the way to soccer practice instead of grabbing my prepped wrap to eat along the way. 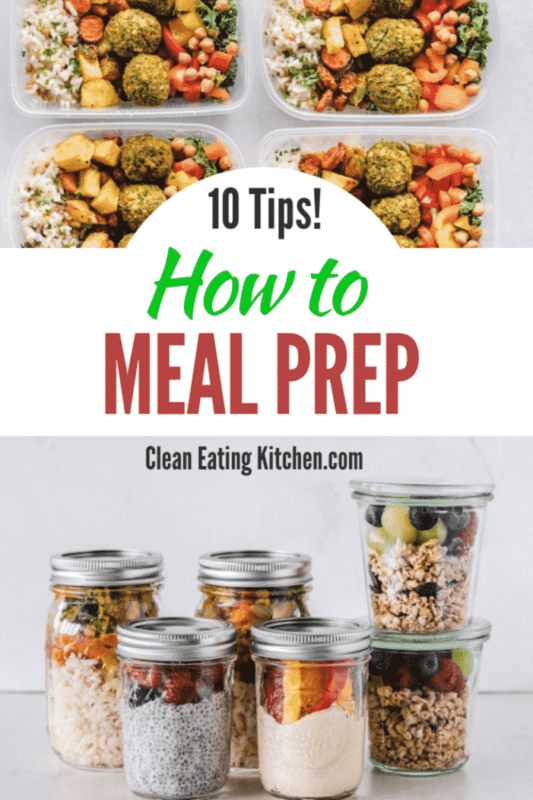 I LOVE all of these ideas – Great tips and info and perfect timing, my family and I are trying clean eating and want to utilize prep and organization to keep us on track. I’m really interested in the instant pot and one-pot meals for convenience. I’ve pinned your post for future reference – Thank you so much for all the valuable info! I hate cooking but when I do it’s always through meal prepping. There are some great tips in this post! I really need to do prep work like this. I bought an instant pot in September and have yet to use it. I know once I start it will be easy enough it’s just having to learn yet another thing that seems so insurmountable. The busier I get the more I love the idea of food prepping! One of the biggest benefits you mentioned would be that it is a great way to reduce food waste. Sometimes when I am a disorganized food shopper I buy a lot of things that don’t end up getting eaten because I didn’t have a plan for what I was going to make. It really is such a smart idea. That is such a great point, Tessa! I hadn’t even thought about the benefits of reducing food waste! Meal prepping makes life so much easier! Great tips! Great tips! I’m definitely a fan of multitasking while cooking, pre-chopped produce, and breakfast for dinner! In fact, as a kid, I always got excited when my mom announced we were having scrambled eggs and toast for dinner. I’m not a huge fan of prepping entire meals, but there are a few things that I prep to cut down on time throughout the week. I love having things prepped for breakfast though, my chia seed pudding is one of my favorites. So easy & such a time savor! Meal prep definitely reduces stress! I love having everything planned out for the week! I seriously think meal prep is such a wonderful idea. I get to control what I eat and also time saving and cost saving too since buying in bulk. This is especially ideal for people like me who are into fitness.